Looking for something to get your creative juices flowing in 2019? Look no further… because the Leading Lights, Light Reading's prestigious annual awards program, is once again open for business and we're looking for the industry's most compelling submissions. The make-up of the Leading Lights awards -- which celebrate the innovation, hard work and business success of the communications industry's leading companies, teams and individuals -- has changed over the course of its 15 years to reflect the evolution of the communications networking and services industry, and this year is no different. Most Innovative AI/Analytics Strategy: Awarded to the company that has devised the most innovative strategy built around the development or use of AI/analytics capabilities during the past year. Most Innovative Blockchain for Telecoms Strategy: Awarded to the company that has devised the most innovative blockchain-based strategy in the telecoms market during the past year. But that's not all. As ever, we're seeking nominations for the Light Reading Hall of Fame, which recognizes those individuals, both the famous and the infamous, who have made a notable contribution to the global communications sector. Among those inducted in previous years are Steve Jobs, Bob Metcalfe, John Chambers, Brian Roberts, Kris Rinne, Martin Cooper, John Donovan, Mukesh Ambani, Irwin Jacobs, Larissa Herda, James Crowe, Niklas Zennström, Edward Snowden, Reed Hastings, Hedy Lamarr, Bernie Ebbers, Basil Alwan, Mark Zuckerberg and John Legere. 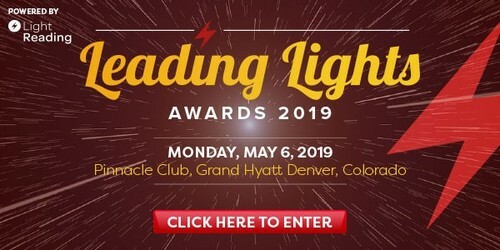 You can see the full list of awards categories, details about how to enter, and a link to our FAQ document, at the Leading Lights 2019 home page. Please pay close attention to the rules, and be sure to keep within the 300-word limit of the main pitch of your submission -- we'll be counting! And here's a critical piece of information: Products, services and strategic directives must have been announced on or after March 1, 2018 to qualify for consideration. So if it was launched in 2015 (yes, you know who you are from last year…) or even in February 2018, then it won't qualify. So please be sure to read the guidelines and check the FAQ document too. The awards are judged by the Light Reading editorial team with help from the Heavy Reading analyst team. The deadline for entries is Friday, March 22, 2019. The shortlists will be announced in early April and the winners announced at an awards dinner in Denver (further details to follow) on Monday, May 6, as a kick-off to our Big 5G Event. With the advent of 5G accelerating the shift towards a more cloud-oriented, distributed, intelligent and ultra-broadband world, there's as much innovation in this industry as ever. We look forward to discovering even more about the industry's efforts during the past year in your submissions. So don't delay! There's even a discounted entry fee for those who can get their submissions in by Friday, February 22. But the most important thing to do is enter -- so get cracking!